MP2,MP4, M4A,MPC(MusePack),AC3, TTA,SPX(Speex), and WavePack. And convert audio between most popular audio formats: wma to mp4, flac to aac, ape to flac, wv to mp3, wav to flac, mp2 to mp3, mp3 to aac, ape to mp3, tta to mp3, ac3 to mp3, flac to mp3, midi to mp3,midi to ape, midi to flac etc. 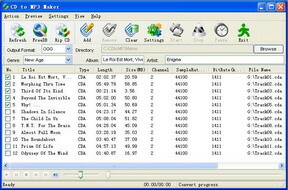 CD ripper, Audio converter,Audio cutter, Audio joiner. It is a five-in-one music converter that includes the following modules: CD ripper, Audio converter,video to audio converter, Audio cutter, Audio joiner. Supports over 150 audio and video formats.